Erply, which have developed a Retail POS Software System for multi-store locations, have their headquarters in New York. Their web-based retail software includes modules for every aspect of retail establishments. Erply specializes in the retail and service trade and unlike Breadcrumbs and Lavu Point of Sales solutions, you cannot use them for restaurants or bars, only fast food chains. The ability to centralize day to day operations into one real time system, whether you have one or five hundred stores, is an integral feature of Erply retail management software. Access to all reports and information from the web, mobile or in-store from any device helps management supervise and run their stores flawlessly. You can run Erply on any device with a web browser, using iPad and Android apps, which provide the freedom to view business transactions, make internal changes and updates from anywhere, at any time. Erply offers the option of running their software through various devices and gives you the ability to grow with scalable solutions and innovations. All your data systems and access points are integrated via dedicated cloud servers for added security. Erply offers 3 packages you can choose from. The first is a $39/Mo that includes POS for small shops without inventory. The 2nd is a $69/Mo that includes Inventory for webshops and warehouses . The 3rd is a $99/Mo for High volume single or multi-store retailers. Erply Enterprise Resource Planning, Point of Sales system, Inventory management and other solutions that are geared for the retail trade, are ideal for running large retail chains whether they are clothing, footwear and jewelry stores, or service shops like beauty parlors and fast food chains. With the mobile and cloud hosted platform, Erply provides analytical data that is always available to management and store personnel. Powerful tools are available for users to integrate any other programs from e-Commerce to Accounting and Payroll services. With Erply it is easy to create a centralized management solution for all operations within the retail trade. Erply is a real-time retail software system that manages all areas of a retail organization including point of sales, inventory, back office sales, employee payrolls and customer CRM. You can also apply multi-channel e-Commerce if you sell online, in one integrated system. With Erply retail software systems, you do not have to rely on the internet to perform daily tasks. With 100% functionality, your point of sale system will work through the cloud-based system even when you are offline. The registers run completely independently and synchronization happens the minute you are back online. There is no limit to how many stores you can run through Erply. Whether you have one or hundreds of stores worldwide, you can use this retail system to run all your stores through a central system with analytical reports and feedback that will help you manage your stores successfully and efficiently. Advanced inventory management software and cloud technology give you real-time overviews of your whole operation. Point of Sale: Simplify running multiple registers through the efficient POS system that is cloud-based, mobile and easy to use. Erply offers a fully integrated, Point of Sale system for iPad and tablets through Windows PC, Android smartphones and dedicated POS hardware. Have the full capability of ringing up sales, tracking customers, managing inventory and employees through any LAN or wireless network. Synchronization with your accounting package in the back office, happens automatically. With multiple stores, you can easily view real time sale totals and view reports that will break down payment types or sales items. With the inventory management app you will also be able to view your stock reports, which you can customize through the Erply custom report generator. With this point of sale system you can suspend sales, void or return items with scanned barcodes, look up any product quickly and view registers totals with a breakdown of payment types. You can also manage your staff through the point of sales system. Commissions and multiple layers of awards can be set up as well as the usual employee time clock and scheduling which will result in clear reports. Integrated Payments with PCI compliant solutions are offered through a secure payment processing platform. Erply payment processing allows you to accept all types of card payments. Electronic signature capture and PIN debit. Franchise Management, Software and Franchise POS is another section of the Erply technology that provides the tools to manage franchises. This franchise software provides peace of mind between head office and the franchisee, allowing head office to keep track of how the business is doing without being too intrusive. Only data that is agreed on between the two can be viewed by head office, while the franchisee has his own Erply point of sale system to work his individual store. Head office can issue gift cards and promotions to all their franchisees instantaneously, whenever there is a nationwide promotion. Updating of prices and menu changes can be relayed to all franchisees within minutes through Erply franchise software. Reports in all aspects of retail management are easy to access with Erply software. You can view best sellers, sales by product, customer’s transaction and much more for any given date. Comparison reports for different dates or locations will give you a lot of important information which will allow you to make educated decisions on when to promote special offers and what inventory you need to stock up on. An intuitive dashboard provides quick snapshots of the most relevant data for the day in real time and there are quick links to the most popular reports and sales graphs. These reports can be customized to fit in with your preferences. There is also a news feed which allows staff to communicate with each other whenever it is necessary. Inventory and Barcodes can be customized for your products and all items can be scanned via UPC at time of sales. Inventory management is one of the most important functions of any retail business. Being able to see how much stock you have in real time is essential when placing orders. Keep track of your suppliers with their contact details and store contracts and tie products directly to vendors to simplify purchase order creation. Purchase orders can be customized with your logo and sent via email to your vendors, or printed out as required. The software that is included with Erply allows you to track purchase status, write off damaged good and receive partial orders. Security is taken very seriously with Erply. Your data is only accessible to authorized personnel and only encrypted data is handled for backup and transfer purposes. Erply keeps your data completely separate from other clients in high quality server parks all over the world. It is their aim to provide you with servers in the same region where your company operates. Your company’s retail software has its own physical server space for added security. Data is backed up in two locations in real time. Erply spends nearly half its budget on diverse safety measures which include 24/7 human controlled data systems in high security physical locations. Strict backup procedures and detailed auditing are in place to ensure that data transfers are encrypted and completely safe. Software and Hardware requirements are not specific with Erply and their propriety software formats can be easily integrated with other software using API migration tools. Their software is built from back end and the user interface and front end applications can be customized to meet your needs. Either your IT professionals can build custom retail software solutions or you could allow the Erply developers to handle this for you. An extensive set of ready-made software like integrated POS, Inventory, CRM, PIM and Erply’s retail software provide application programming interface (API) You can choose which applications to use. Mix and matching hardware is not difficult with Erply. Their software is UPOS compatible and supports secure card readers, mobile devices, document scanners, iPads, tablets, printers, cash drawer and customer displays from major brands like IBM, Toshiba and Epson, among others. Integrated software solutions can be created to customize your retail software with any applications that you need to include. Customer Databases can be created in groups for promotions and loyalty programs. Built in coupon generation can be customized for specific promotions which can be created in minutes for all your stores. You can print, email or SMS these coupons to your customers and these coupons can be scanned in at the point of sales for easy redemption. You can also decide to reward store credit to your customer and issue them with loyalty cards. Erply offers a central, real-time gift card control system. Use Facebook and Twitter to capture your customers email addresses or import previous customer lists from legacy systems to enhance your customer database. Customer Loyalty programs are available through the retail CRM module which tracks sales history and email receipt capabilities as well as customer groupings. This is the way to capture customer data in order to be able to send email alerts about sales and upcoming events. Sales and promotions can be relayed to all your stores in minutes through the Erply centralized reporting system. Customer Support is maintained and supported through certified engineers. Erply provides full training for you and your staff through their highly competent team. Maintenance personnel is available in local data centers for all customers. For corporate clients, an entire team can be allocated. The customer support centers are manned 24/7 and they can tackle any problem within a couple of minutes. Their staff go through regular training sessions and they are competent with the latest technology on offer. How does Erply POS compare to other retail POS systems? For small to medium sized retail businesses, Square is the cost effective choice. With no monthly fees and a set rate of 2.75% from every transaction, Square is ideal for start-ups and small retail businesses. Erply charges a monthly fee, starting from $99 per month, payable annually, per location. Both Erply and Square offer extra features which can be added to their point of sales systems, at a price. Square is also suitable for smaller restaurants whereas Erply is specifically designed for the larger retail establishments with multi-store locations. Lightspeed is a point of sales system that is designed to run on both Mac and iOS devices and is suitable for both small and larger multi-store businesses. With Lightspeed you can run an integrated e-Commerce platform and have access to all your data with the mobility of a cloud-based integrated system. Erply offers more choices with existing software and hardware as it is compatible and able to integrate with many different systems. 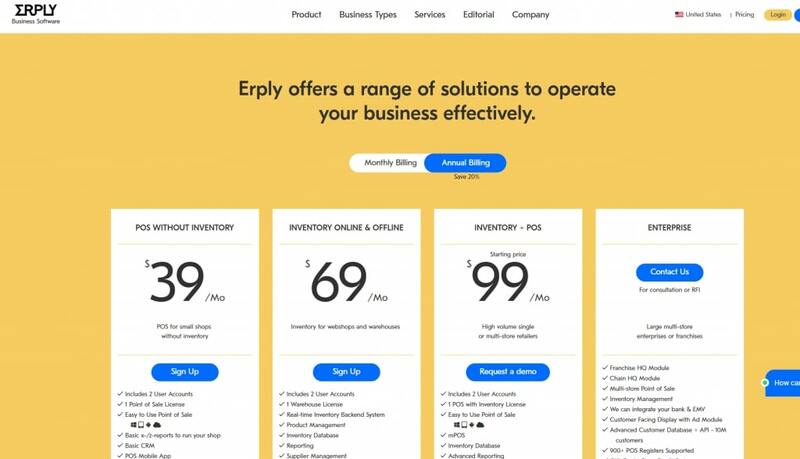 Both Lightspeed and Erply offer packages starting from $99 per month and their point of sales systems are available worldwide. Erply is a bigger player in the international field and can service hundreds of branches or franchise enterprises. Erply also offers a superior inventory management system. Revel is suitable for all types of businesses and can be adapted for both restaurants and retail stores. When it comes to price, Revel does not advertise their pricing system online, but reports have stated that their packages start from as much as $139 per month. Revel also expects their customers to sign a lengthy contract. Erply charges, start at $99 per month for one location. Both Revel and Erply are available outside the US and they have thousands of customers worldwide. The biggest difference between Revel and Erply is that the latter is more suitable for large multi-store enterprises. Revel also services multi-store locations, but not on the same scale as Erply. Revel point of sales system is limited to iOS devices which can be restricting. Simplify running multiple registers through the efficient POS system that is cloud-based, mobile and easy to use. Erply offers a fully integrated, Point of Sale system for iPad and tablets through Windows PC, Android smartphones and dedicated POS hardware. Inventory and Barcodes can be customized for your products and all items can be scanned via UPC. Inventory management is one of the most important functions of any retail business. Being able to see how much stock you have in real time is essential when placing orders. PCI compliant solutions are offered through a secure payment processing platform. Erply payment processing allows you to accept all types of card payments. Electronic signature capture and PIN debit. Head office can issue gift cards and promotions to all their stores instantaneously, whenever there is a nationwide promotion. Updating of prices and menu changes can be relayed to all stores within minutes through Erply multi-store and franchise software.